We Make It, And It's The Absolute Best. 3/8" Thick Clear Lexan. 3/8" Thick Grey Polyteak. Stainless Steel Square Drive Industrial Screws. We Designed It. We Build It. Made To Last. Period. We are proud to introduce you to the very best birdfeeder ever available. First, we start with 3/8" thick Polyteak, a tough industrial material designed for the marine and boating industry. Polyteak is designed to withstand constant submersion in seawater and exposure to sun and ultraviolet rays. 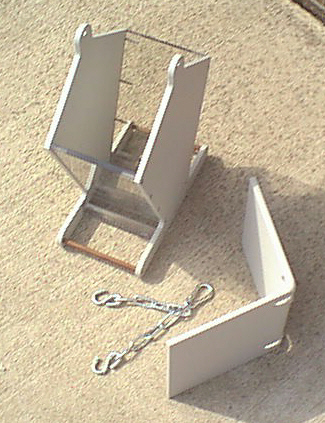 It is used for marine swim platforms, hatches, counters, and doors. Then we precision machine it into the side panels, and drill 11 holes in each side for the stainless fasteners. The top is machined, then heated and bent from one solid piece. Now the Lexan. Used in security windows, bulletproof in laminated versions. Repeated blows from a baseball bat bounce right off. 250 times stronger than glass. It's in our feeder. We take 3/8" thick Lexan and cut it to size (many feeders use 1/8" acrylic, a thinner, weaker material). Then we precision-drill the assembly holes. All pieces are fitted together, the PVC perches are installed, and everything is fastened with 22 stainless steel screws to form an extremely strong unit. 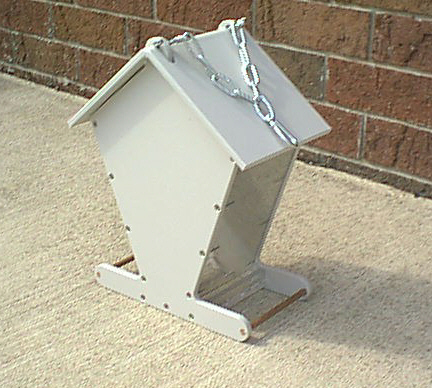 We then add a zinc plated, heavy duty hanger chain and hook assembly that locks the lid in place. Top Fully Removes For Easy Filling. Feed The Birds In A Few Days. Order Now!